I showed you a bit of this quilt a couple of weeks ago while I was still playing with the layout. This quilt came about with a little trial and error (mostly error)…but the seam ripper and I had some quality time and we worked it out. In the end it was really fun (and easy!) to make. I quilted it on my machine with a swirly free motion pattern…my favorite quilting pattern lately and I’m slowly getting better at it. Finished and washed just in time for 4th of July and summer weather. 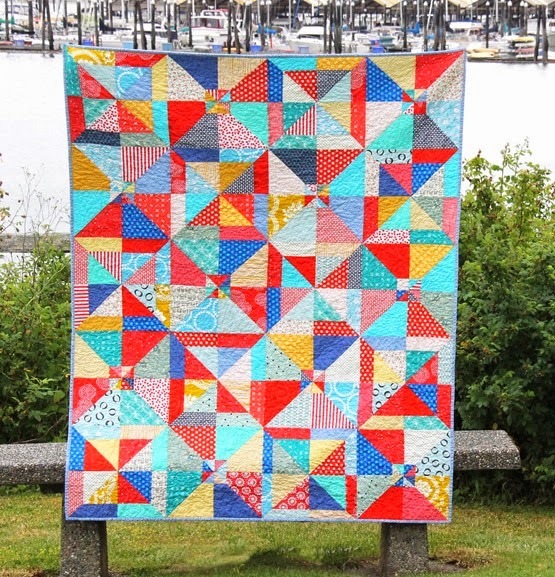 completely summery quilt – love it. Love it! It's so deliciously bright and happy. What type of batting do you use for your quilts? Oh, it is wonderful! So fun and happy! This is bright and cheery! Perfect for summer. Lovely! The colors are perfect for summer! I'm looking forward to the tutorial. Thanks in advance for the tutorial! Love this pattern! Really cute quilt! Can't wait to try out your pattern! Lovely! It reminds me of sailboats on the sparkling water! This a fabulous quilt! It will work great with larger prints too. You are so clever! I love it! Such an interesting design, one that fools the eye and creates a TON of movement! 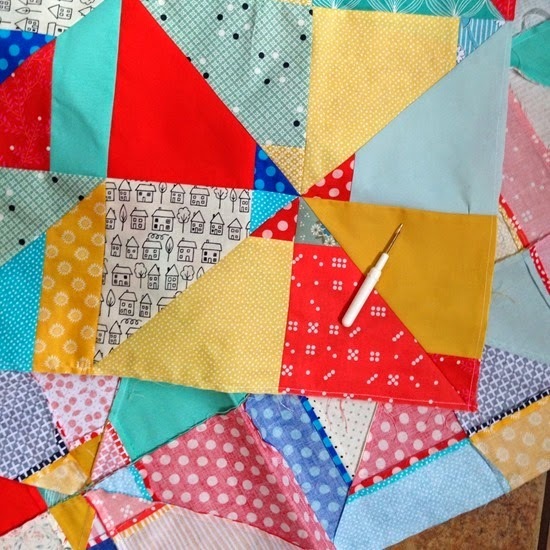 This would be a great quilt to help diminish my ever-huge, never-diminishing scraps! Cheerful and scrappy…perfect! Looking forward to the tutorial! Very pretty quilt! Looking forward to the tutorial. Such a happy quilt, I'm looking forward to your tutorial. I've stared at your post a few times and just when i think I've figured out what you did I realize I am wrong. 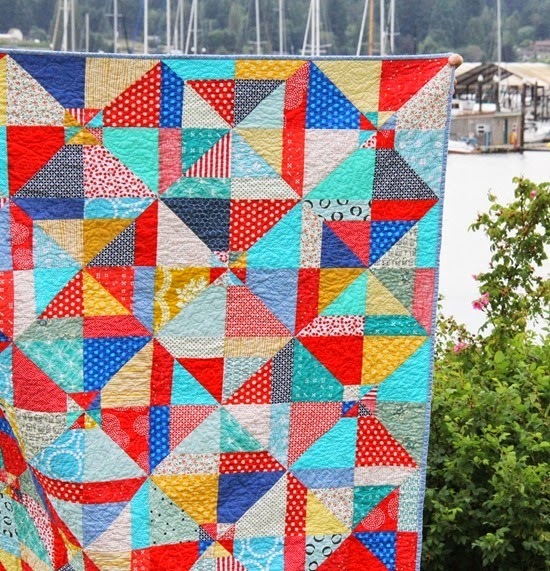 :) Great quilt for Pacific Northwest summers. 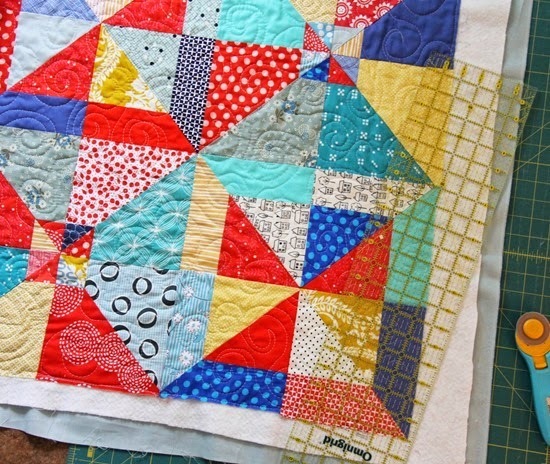 What a fun scrappy quilt! This is a great pattern. 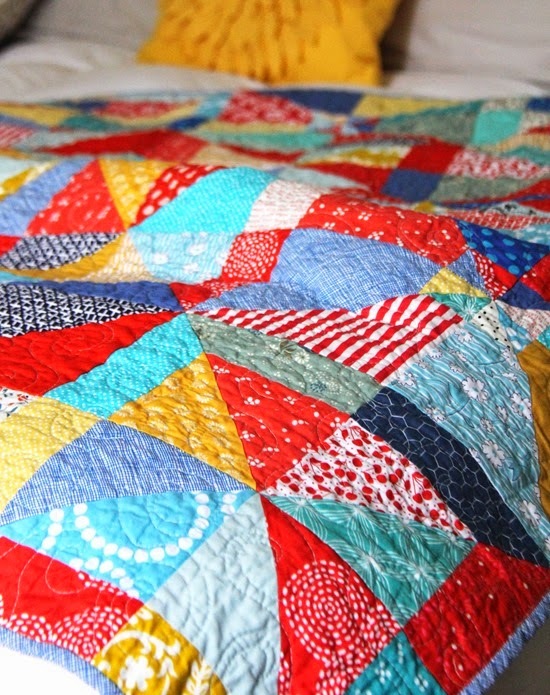 Great colors and quilting. What cotton do you use and it has blended very well. Yea! This quilt looks like it would be super fun to make. Wow! I love your quilt. Just my colors, a quilt to put on my couch and add some color to a room. I can imagine so many possibilities. Thanks for sharing and I look forward to your tutorial. Perfect colors for a Fourth of July Quilt. So cheery! Love the pattern! I'm glad to hear that professional pattern makers come up with layouts the same way I do, trial and error and moving and swapping pieces, kind of like a jigsaw puzzle. Your quilting is fine, but I do like how when you wash and dry a quilt you can't notice the quilting anyway.